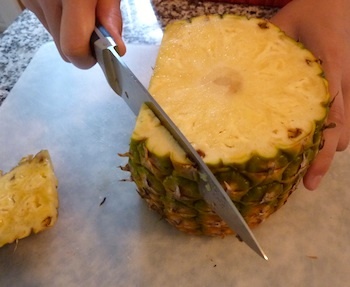 Follow these easy steps to learn how to cut a pineapple into perfect slices or chunks in just a few moments. 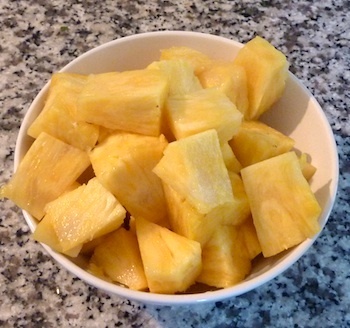 Juicy fresh pineapples are tastier than canned pineapple, but their spiky tops and rough skins look hard to remove. Not true! 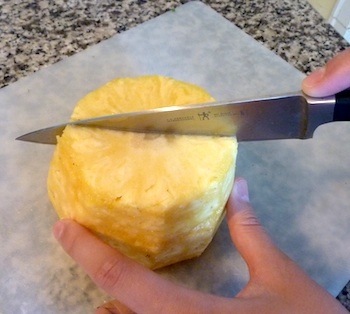 Once you know how, cutting up a fresh pineapple is as easy as opening a can. 1. Choose the best. Select a ripe, flavorful pineapple. How? Apply the "sniff" test. Yes, hold the fruit near your nose and sniff it to make sure it is fragrant. Don't worry that you'll look weird smelling the fruit in the market. Others will copy you! The "sniff" test tends to be much more accurate than judging by color because the outside doesn't tell you much about ripeness. See how the top of the pineapple in the photo looks green? If I'd chosen based on color, I wouldn't have picked it - yet it smelled wonderful and tasted sublime. 2. Make the first cut. 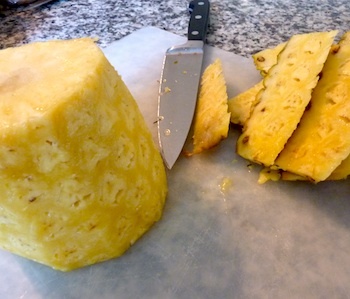 The first step in learning how to cut a pineapple is to lay it on its side on a cutting board. Using a sharp knife, cut off the top and the bottom. Remove enough so that none of the brown, fibrous skin remains. Discard the top and bottom into a compost bin or the trash, and use a paper towel to sop up any juice from the cutting board. The first cut will be the widest - be sure to make you cut behind the "eyes"
3. Remove the skin and "eyes." Stand the pineapple upright on one end. Position your knife to cut away a top-to-bottom swath of the rough outer skin. See the "eyes"? They're actually like tiny spikes boring into the fruit. Make sure you position your knife's blade to cut the eyes come off with the skin. 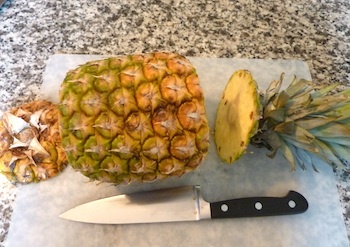 In one motion, slice off the skin and eyes from top to bottom, following the curve of the pineapple. 4. Finish cutting off the skin. After the first cut, your other cuts can be somewhat narrower so that you don't remove too much fruit. Position your knife at about a 30° angle to the first cut. Again, slice all the way down, removing both the skin and eyes. Repeat this process until you've worked your way around the entire pineapple. Continue to discard the skin and other trimmings, and wipe up the juice. If any eyes remain, use the tip of your knife to remove them. 5. Remove the core. 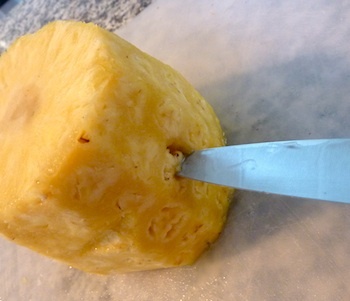 Removing the fibrous pineapple core is easy, but you need to have your end goal in mind. Regardless of what you want to end up with, the process is easy. For half-slices or chunks, the first step is the same: place your pineapple in an upright position, and slice it in half lengthwise. 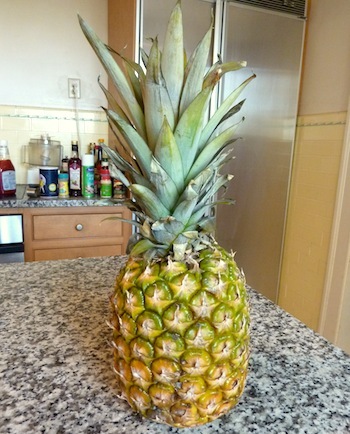 For half-slices, cut each pineapple half horizontally. Stand each piece upright, and carefully carve out the core. Slice the pieces horizontally. 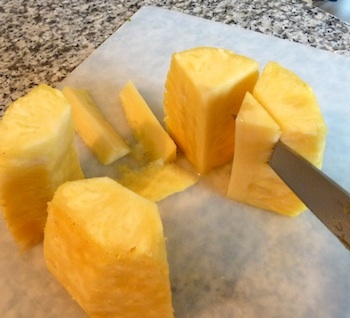 For chunks, cut each pineapple half again lengthwise. Stand each piece upright, and make a straight cut down the center to remove the core. To make perfect pineapple rings, you need a commercial corer. Fortunately, for home use, the inexpensive pineapple corers work reasonably well. You can sometimes find them in kitchenware stores, and will also find various varieties listed on Amazon. You can expect to get a generous 5-6 cups of chunks from a whole fruit. 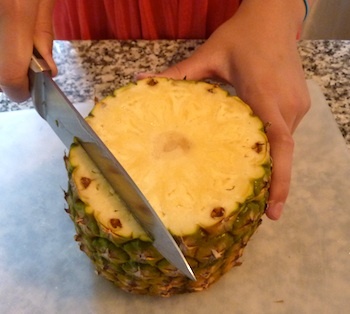 As you can see, learning how to cut a pineapple can save you money! Fresh pineapples make a healthy snack for school, work, or weekends. I especially love to pair this fruit with shrimp - check out my shrimp and pineapple pizza, and grilled shrimp kabobs.